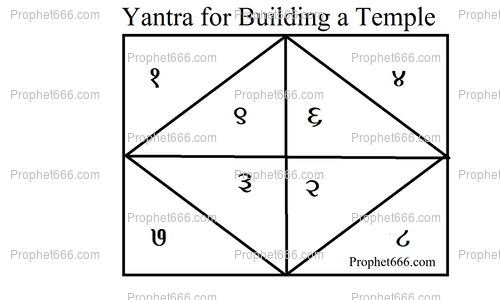 For those pious and well-meaning people, wishing to build a temple, Ashram or any Holy Shrine there is a specific Hindu Devotional Yantra Sadhana, prescribed in the Tantra, which is believed to enhance their chance of getting success in fulfilling their ambitions. In this post, I have described the method of this simple Bhakti Yantra Experiment. The Mandir Nirman Yantra Sadhana as this experiment is called in Hindi should be commenced on a Thursday after having a bath, wearing fresh clothes and lighting a Diya and Agarbatti before the Puja Place. 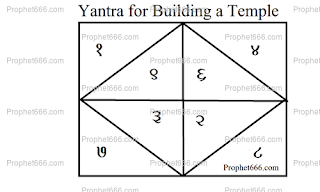 The Mandir Banane ka Yantra shown be me in the image should be drawn on a Bhojpatra with Saffron Water using a pointed wooden stick, 7,000 times in all by preparing a fixed number of Yantras per day. After all the 7,000 Yantras have been drawn, they should be collectively worshipped by offering Diya, Agarbatti and Scented Flowers. An Aarti of the God or Goddess, whose Mandir, the practitioner wishes to construct should be chanted. Finally, all the 7,000 Yantras have to be immersed in the flowing water of a river, sea or a canal. This concludes the Mandir Nirman Yantra Sadhana. Sir do we have to worship any god for this yantra prayog? The Tantra has not specified anything more, but you can worship Ganesha for success before commencing the Prayog and then the God whose Mandir you are wishing to build.